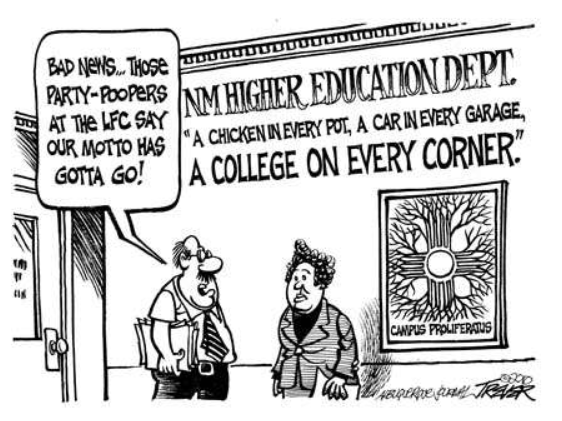 UNM priorities: sports, better-paid faculty, or a multitude of branch campuses? The University of New Mexico (along with most of our State’s higher education system) wants to be all things to all people. External pressure is finally forcing some painful change, but are they the right changes and will it help our State or merely shift the proverbial deck chairs? 4) The University’s sports programs operate at a deficit and plans to cut four sports have generated outrage and opposition from both candidates for Governor. 5) New Mexico has a plethora of branch campuses. Cuts to athletics as were recently made by the Board of Regents are appropriate given the $4.7 million deficit facing the program (and issues with Title 9 compliance, but the exact makeup of the cuts is open to question. It is a real mess and the only thing politicians seem to want to do about it is to spend more money. New Mexico’s higher education system is driven by political patronage, with the primary mission of building campuses and creating administrative jobs. Educating and graduating students is beside the point. I’d like to see a constitutional amendment to place the entire state college system under unified administration. Many states have an elected board of trustees and this may be a good model for New Mexico. I do not expect this to happen, however.